LA County Public Defender Ricardo García speaks with employees before the training. 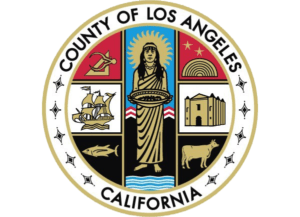 Kicking off the Office’s first-ever mandatory training of all attorneys and paralegals on representing noncitizen clients, LA County Public Defender Ricardo García emphasized the need to protect the rights of a population under fire. García thanked Graciela Martinez, head deputy of the Immigration Unit, for not only organizing the training, but for her relentless work in the community educating legal professionals on the best ways to uphold their “Padilla” duty. Padilla v. Commonwealth is the 2010 case in which the United States Supreme Court decided that criminal defense attorneys must research and properly advise, and when possible, minimize the impact of the immigration consequences to noncitizen clients in their pending criminal matter. It’s a daunting task. According to the agency that implemented the training, the crossover between immigration and criminal law is among the most complex and technical areas of law. 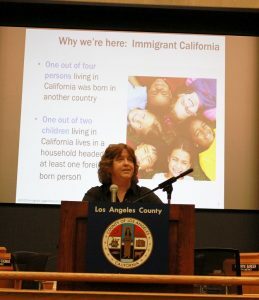 Kathy Brady, a senior staff attorney at the Immigrant Legal Resource Center, provided most of the training. Introducing instructor Kathy Brady, a senior staff attorney at the Immigrant Legal Resource Center with whom she has worked for many years, Martinez said such training was more crucial now than ever. The day included, in part, instruction on how to identify, analyze and defend against the adverse immigration consequences of various charges, using case scenarios and exercises. 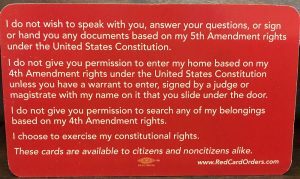 Stacks of “Red Cards” were dispensed, which help clients assert their rights and defend themselves in many situations, including when ICE agents go to a home. The cards are in English on one side and Spanish on the other. Red Cards, English on one side, Spanish on the other, help people express their rights. Deputy Public Defender Evan Franzel was grateful for the training. “It’s imperative that we as public defenders know how to help stop our noncitizen clients from being permanently separated from communities and families. This training helped me gain the knowledge and tools I need to advise and protect my clients” he said.